The Tortuga Computer Workstation matches the style of our Tortuga Shelving System available as single sided units, together with Add-on units as required. 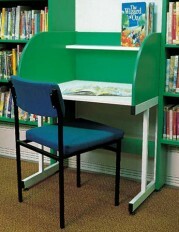 The top section comes complete with worktop including cable outlet available in matching colours to the Tortuga Shelving System and stands on a steel frame painted in either standard colours black/white or special colours to match library colour scheme. 1028mm high x 1290mm wide x 730mm deep (worktop height 670mm).